A leading historian of the Enlightenment explores the widely differing philosophies that led to the American and French revolutions and their social, cultural, and ideological impacts on the world. Key themes of all revolutions include democratic vs. aristocratic republicanism, support or rejection of universal rights, suffrage qualifications, and the place of religion in society. At the heart of most of the Atlantic Revolutions of the late 18th century and first half of the 19th century was the rivalry between moderate and radical enlightenment. The moderates sought mixed government along the British lines while the radical side demanded separation of church and state and no established monarchy or aristocracy. In this epic work of historical scholarship, Israel (Emeritus, Modern History/Institute for Advance Study, Princeton Univ. ; Revolutionary Ideas: An Intellectual History of the French Revolution from The Rights of Man to Robespierre, 2014, etc.) amply explains the concepts that drive revolutions and how they are shaped by organized vanguards interpreting the general discontent and challenging the status quo. He also explores the many different intellectual forces at work: the influence of writers like Locke, Montesquieu, Hume, and Paine, and especially the almost polar differences among radical and moderate revolutionaries. Showing the significance of the French Revolution in America, Israel notes that the Reign of Terror was viewed as a horrific aberration. Meanwhile, the Jeffersonians constantly butted heads with the Hamiltonians, and while Benjamin Franklin embodied the highest values of the American Revolution in Europe, his radicalism was divisive. Due to this friction, as well as incompetent ambassadors from both France and America, it is actually surprising that the American Civil War didn’t break out much sooner. 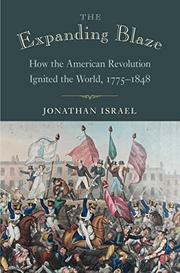 This is not just a history of the French and American revolutions, however, as the author masterfully examines Canadian involvement, the Haitian slave rebellion, the four Anglo-Dutch Wars, and fighting in the Cape Colony and well beyond to Greece, Spain, South America, and other areas. An impressively broad scholarly history whose readability and smooth organization make it a joy to read.